results in the log file. managed to fix that particular error. As you can see in the image above, the fourth and eighth (f) lines highlighted in pink don’t have (fix) on the next line and are therefore not fixed as the checking continues. 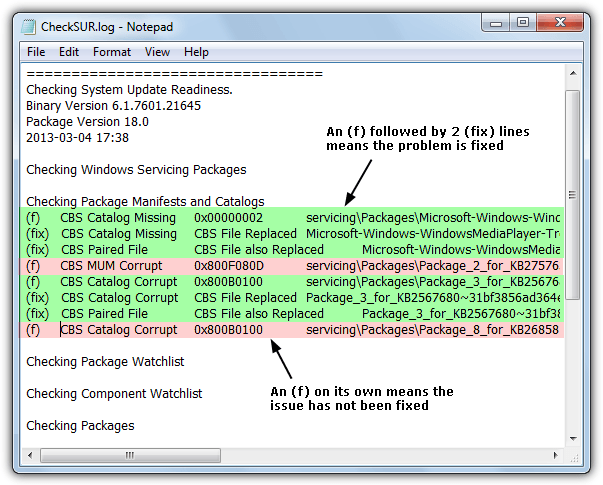 You need to make a note of all the unfixed “MUM” entries in your log file (line 4 above is a MUM error that wasn’t fixed). 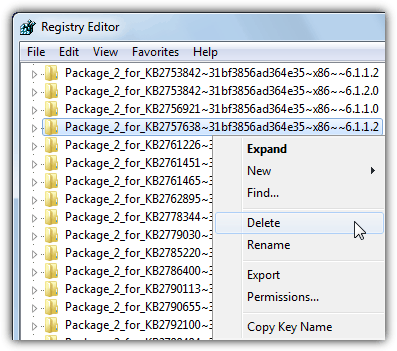 Now you will need to manually delete the related registry keys according to what you see in the CheckSUR.log file. Run regedit and go to the following location. So you’ll need to look for that key in the registry at the location stated above and then delete it. There won’t be a need to use the .mum extension in the registry. As long as the whole name matches without the extension, you can delete it. After many hours of laboriously deleting registry entries I now have a populated Windows Features window. There was probably a quicker method as indicated in Ramin's article but I didn't fancy messing with the Registry permissions so I used Registrar Registry Manager to delete each one and that seemed to override any permissions restrictions. Anyway, all done now so thanks Ramin. I am very glad you got it working, and Thanks.